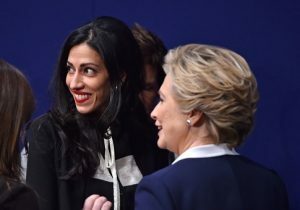 Failed Democratic presidential candidate Hillary Clinton has paid Huma Abedin nearly $65,000 from her campaign funds since her November election defeat, Federal Election Commission filings show. Records show Abedin, Clinton's longtime friend and aide who served as the vice chair of the campaign, has been paid $64,415.10 in salary from Hillary for America, Clinton's campaign committee, since mid-November. From mid-November to the end of March, Abedin was paid $52,180.65 from Hillary for America. From the beginning of April until the end of June, Abedin was given another $12,234.45 from Clinton's campaign committee. Abedin is not the only individual who is still receiving payments from Clinton's campaign. Nick Merrill, Hillary's former press secretary, was still receiving checks from the campaign as of late June, the end point for the latest available figures. Robert Russo, who was the director of correspondence and briefing for the campaign, now carries the same job title in the Office of Hillary Clinton and is still being compensated from Clinton's campaign committee, as are a number of other staffers. Clinton has also sent $800,000 from her campaign funds to Onward Together, a "resistance" group that she launched earlier this year, the Washington Free Beacon previously reported. Clinton's political action group will fund a number of other "resistance" groups that have impressed her since the conclusion of the election. Clinton is working with former aides and donors on the project. "From the Women's March to airports across the country where communities are welcoming immigrants and refugees to town hall meetings in every community, Americans are speaking out like never before," Clinton wrote in an email to supporters in May. "I believe more fiercely than ever that citizen engagement at every level is central to a strong and vibrant democracy." "In some cases, we'll provide direct funding to these organizations. For others, we'll help amplify their work and do what we can to help them continue to grow their audiences and expand their reach." Clinton's campaign reported sending the $800,000 check to Onward Together on May 1. Clinton, who publicly announced the launch of the group on May 15, had already financed Swing Left, Run for Something, and Emerge America, all liberal activist groups, at the time of the announcement. Emailed requests for comment to the Clinton campaign bounced back as undeliverable.